Osmio's latest compact, portable and countertop reverse osmosis water filter, the world's first revolutionary, installation-free household Reverse Osmosis (RO) counter top water purifier which also serves to provide, ambient, hot and boiling hot water at your fingertips with great ease of use and easy maintenance. A filter kettle like other portable purification system. The most efficient RO system on the planet! It's just so good! There is nothing else like this on the market. It solves the cost and time of installation and you can take it anywhere and have it in any room. It's really easy to fill up the water, you just take out the tank, fill it and pop it back in. The unit is completely stand alone with no connection to the drain. The unit is incredibly easy to use and assemble. Simply take it out the box, plug it in and fill the supply pitcher. Place it back into the system and turn the dial to adjust the temperature and press to dispense and stop, that's it! Within minutes you will have reverse osmosis quality water, ambient, warm, hot or boiling at your fingertips! In order to spread the wonderful benefits of our system, we would like to offer a free 4 pack replacement set to any customer who has a friend or relative who would like to order one, and your friend will receive a free replacement pack too! Just ask them to quote your name and postcode when you call to order! We offer a 1-year warranty for customers in medium hard up to 200 ppm Calcium Carbonate Hardness and TDS of 250 ppm. 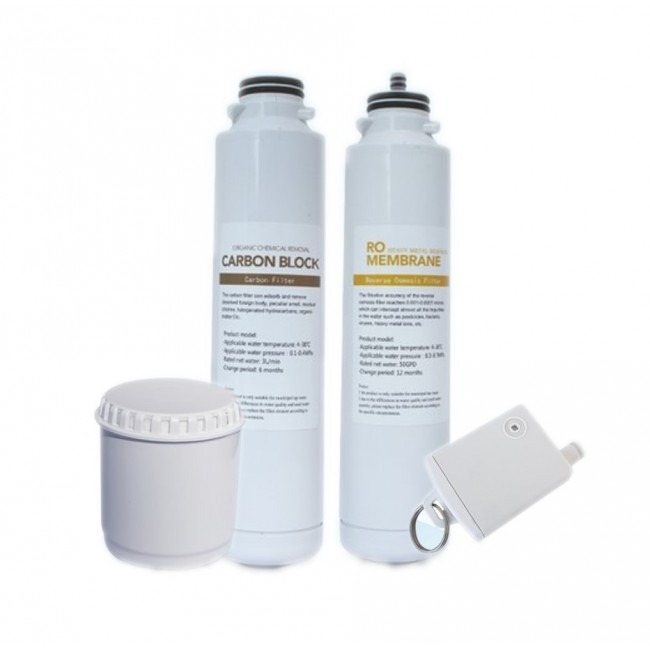 For customers with harder or water with higher TDS, we do not recommend this product unless you are happy to make be more frequent membrane filter changes. The unit is designed to shut off if there is blockage in the membrane or prefilters. As the system recirculates the rejected water from the membrane, the TDS level continually rises of the water entering the membrane filter. Therefore, for those with water of higher TDS, more frequent membrane changes are required. The first thing to note is that the system is amazingly easy to use and maintain and as Osmio, we have spent great investment into the product and our culture is customer care. We are passionate about our products. The system is designed with ease and practicality in mind. The unit has a very simple user interface. Water comes with the turn of a dial and there is no complicated user manual needed. The system is fully portable and just needs to be plugged into a power supply. It does not need to be installed into household plumbing. Any water source gives you easy access to fresh and healthy RO pure water at any time. Changing the filters is really quick and easy. They come off and go back on with a simple twist function. The color coded LED instantly shows when the filtration has completed. 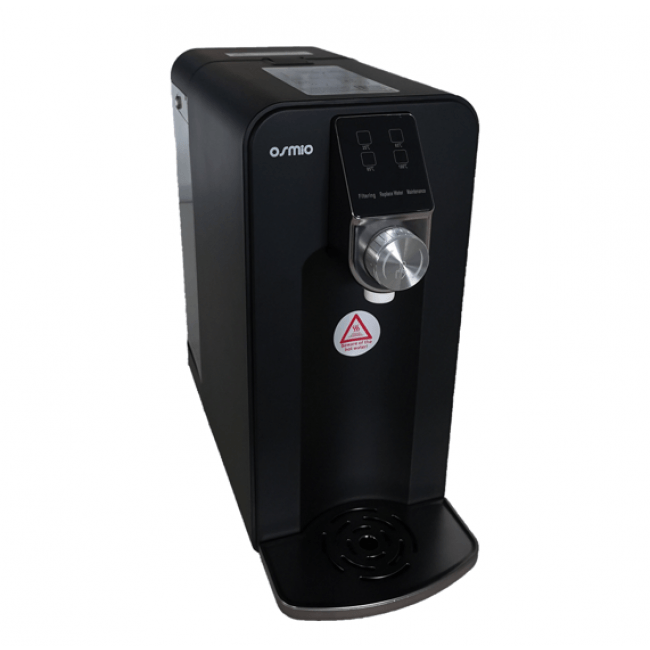 The intelligent, automatic, power-saving motor design, gives an instant supply of filtered water and automatically shuts off when filtration is complete. An ideal investment for small households! There is just the need to plug it into a normal power supply. Only a power connection via a simple plug socket - done! The system has an automatic shutdown mode, after 1h the device switches off automatically, so you save power! 4 - Quick-Change Insertion Filters: Hygiene After-filter antibacterial: removes 99% of the bacteria and viruses and improves the taste.